Olympia might be famous for its water, or more specifically its beer, or its status as the state capital. But for the past 30 plus years, Olympia has been the fertile ground of a thriving music scene. While it’s impossible to cover all the famous musicians who have made their homes in Olympia at one time or another, let’s look at three of the biggies. Take a walk with me on a tour through some of Olympia’s musical history. Born in Aberdeen, grunge rock icon Kurt Cobain was the lead singer of Nirvana. Before Nirvana achieved superstardom, they spent some time living in Olympia. Cobain found himself surrounded by plenty of musical inspiration in the area, and before grunge was a thing, he was a part of the punk rock music scene in Olympia. Many of Cobain’s friends and acquaintances in Olympia were also a part of the emerging riot grrl music scene. 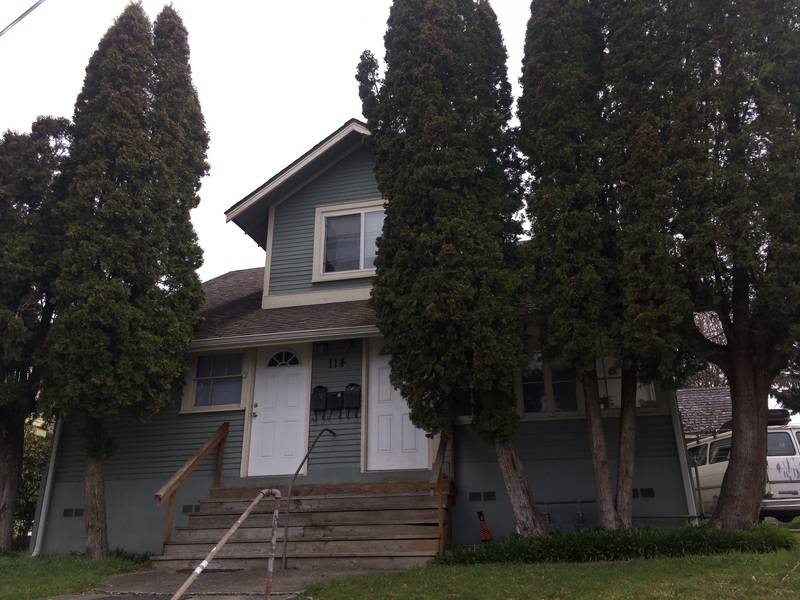 From 1989 to 1991, Kurt Cobain lived in two of the homes (number two and three) in 114 Pear Street, a blue triplex with former girlfriend, Tracey Miranda, and later, bandmate Dave Grohl. According to numerous sources, many of Nirvana’s most famous works began there, including their breakout hit, “Smells Like Teen Spirit” which was inspired by graffiti written on the wall at 114 Pear Street by Kathleen Hanna, Bikini Kill vocalist. Remember as you’re following in Cobain’s footsteps, to be courteous and stick to the sidewalk, as 114 Pear Street is a private residence. 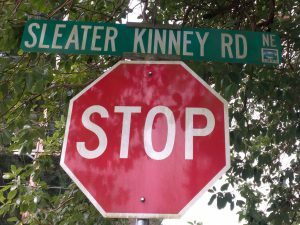 Some bands are named after cities, others after states, and even whole continents, but Sleater-Kinney is named after the six-mile-long road in Lacey. Reportedly, one of the bands’ early practice spaces was in a house on the road. 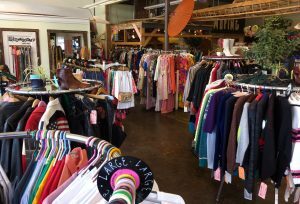 If you feel like taking a stroll down Sleater-Kinney Road, perhaps stop at one of the thrift shops on or near it. Rapper Ben Haggerty is known to most as Macklemore. A Grammy award winning artist, Haggerty is known for his catchy tunes that often touch on social themes. Though he is originally from Seattle, Haggerty spent quite a bit of time in Olympia from 2004 to 2009. Stroll down the aisles of any number of local thrift shops, like downtown’s Dumpster Values, and maybe you will find your next “come up” as Haggerty’s catchy tune suggests. Haggerty isn’t the only fan of thrift shops. Cobain publicly expressed an appreciation of second-hand stores, saying that money didn’t buy him happiness, and that having wealth was nothing like the excitement of finding a treasure in a second-hand store. Create your own style with something from a local thrift shop, or find the perfect flannel and bring back 90s grunge and walk in the steps of the musical icons. 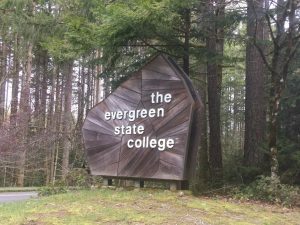 We wind out our tour at The Evergreen State College, a place that is connected to all three subjects of our musical tour, and has a long history of encouraging music and the arts. Though Cobain never attended college at Evergreen, Nirvana played shows there, were featured on 89.3 KAOS, the school supported radio station, and even filmed in the television studio. If you want to follow in their footsteps, tune your radio to FM 89.3 or head over to the College Activities Building to hear KAOS on the air. Both Brownstein and Tucker of Sleater-Kinney are Evergreen alumni. Though Tucker graduated before Sleater-Kinney formed, she and Brownstein collided at Evergreen following their initial meeting in Bellingham. If you want to follow in their footsteps, walk over to the CCBLA and find out about how to help SafePlace, a common service-learning partner that many Evergreen riot grrls volunteered with during their time at the school. Haggerty graduated from Evergreen in 2009. While he was there, he participated in the Gateways for Incarcerated Youth program, connecting with kids at the Greenhill Youth Center in Chehalis. If you want to walk in his footsteps, you don’t have to be a student to help, you can volunteer to be a youth mentor. Stop by the Seminar II building. Brownstein’s Portlandia Partner, Fred Armisen, stopped by downtown restaurant The Wayside Café with his equally famous wife, Natasha Lyonne. If you are feeling hungry after your famous footsteps tour, follow in their footsteps and grab some delicious vegan eats.